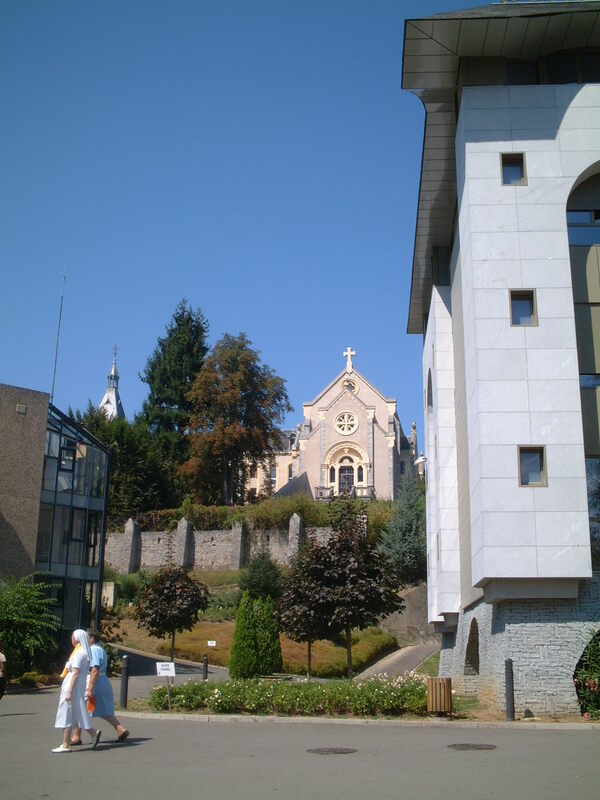 The Carmelite Monastery overlooking the St. Bernadette Church in Lourdes. Overlooking the Grotto of the Apparitions in Lourdes is the monastery of Discalced Carmelite nuns (Monastère du Carmel in French). 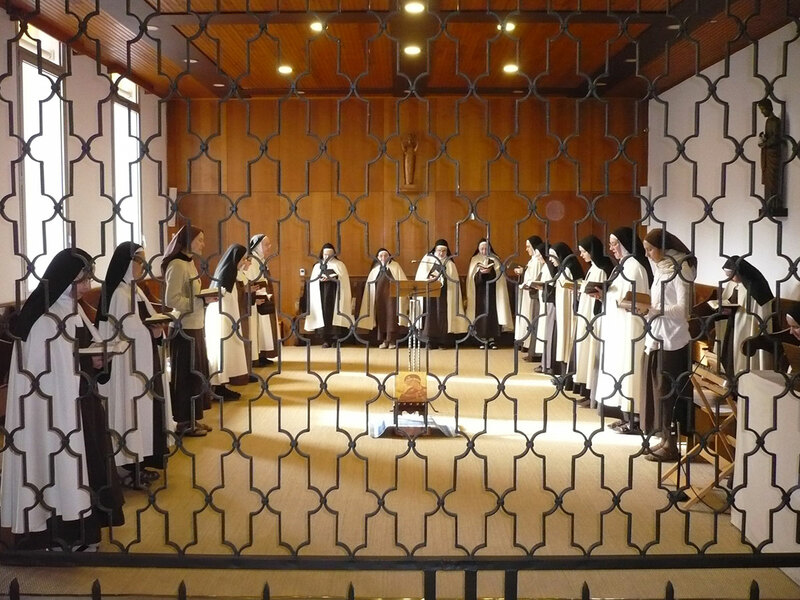 As the nuns are fellow members of the international Carmelite Family, the British Carmelite Pilgrimage to Lourdes tries to support the sisters and their enclosed life of prayer, community and service. 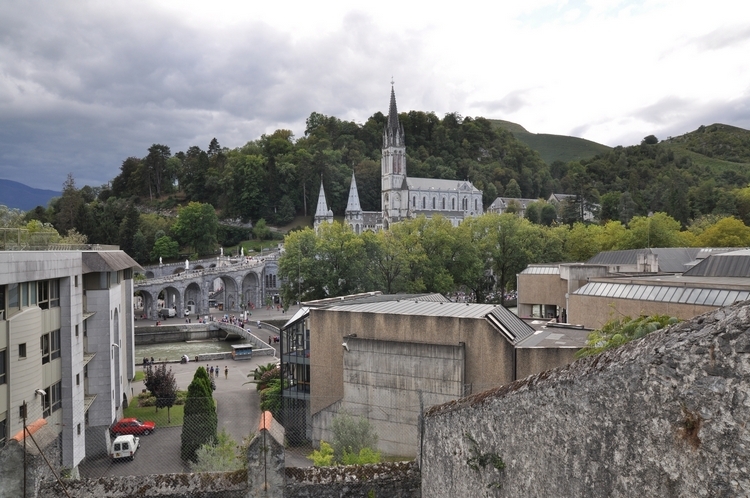 For us, the Carmel in Lourdes is a spiritual home from home. The Lourdes Carmelite Nuns at prayer. 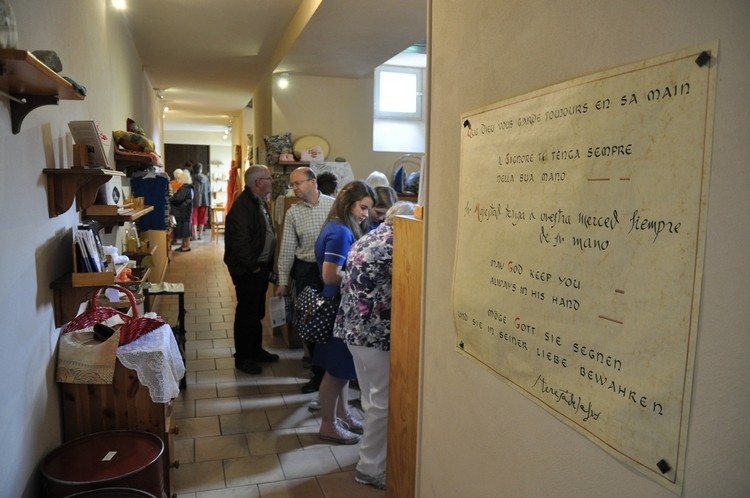 During our annual August pilgrimage to Lourdes with the Catholic Association, the British Carmelite group normally organises an informal visit to Lourdes Carmel, showing pilgrims how to access the Monastery chapel and shop. We are also pleased to publish here further information about the Carmel in Lourdes. 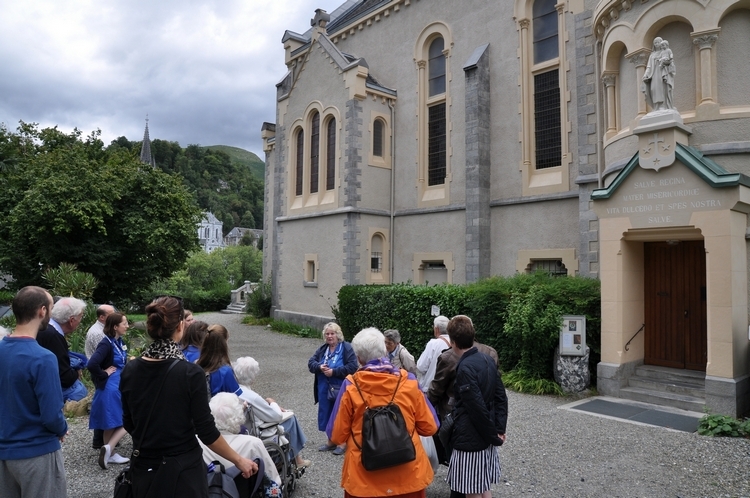 British Carmelite Pilgrims visiting Lourdes Carmel. 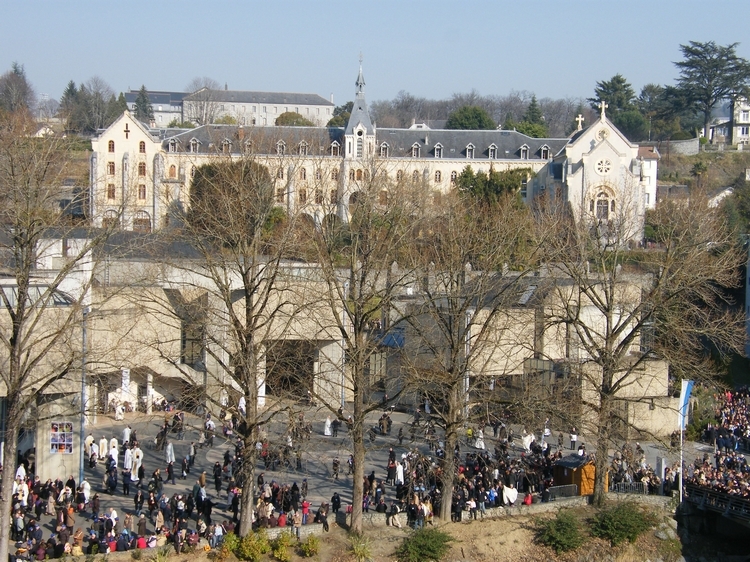 The Carmelite Monastery in Lourdes occupies a spiritually significant site. The 18th and final apparition of the Blessed Virgin Mary to Saint Bernadette Soubirous took place on 16th July 1858, the Feast of Our Lady of Mount Carmel. At that time the civil authorities in Lourdes had prohibitted access to Massabielle Grotto, and so instead Bernadette saw Our Lady from 'La Ribère', the slope overlooking the cave from the other side of the River Gave. 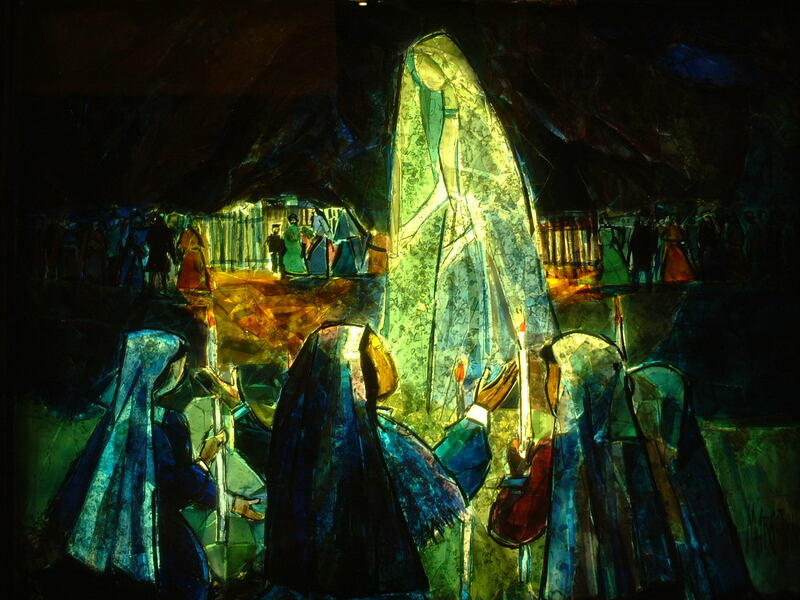 The final apparition of Our Lady to Saint Bernadette, depicted in the 'Gemmail' style of layered stained glass typically found in Lourdes. Despite being physically far away, the encounter between Bernadette and Our Lady was more intimate than ever. Bernadette said that on this occasion Our Lady, who appeared in silence, smiled and looked "more beautiful than ever". One of the ancient titles under which the Carmelite Order reveres Mary is "Beauty of Carmel". seen from the steps of the Carmelite Monastery chapel. 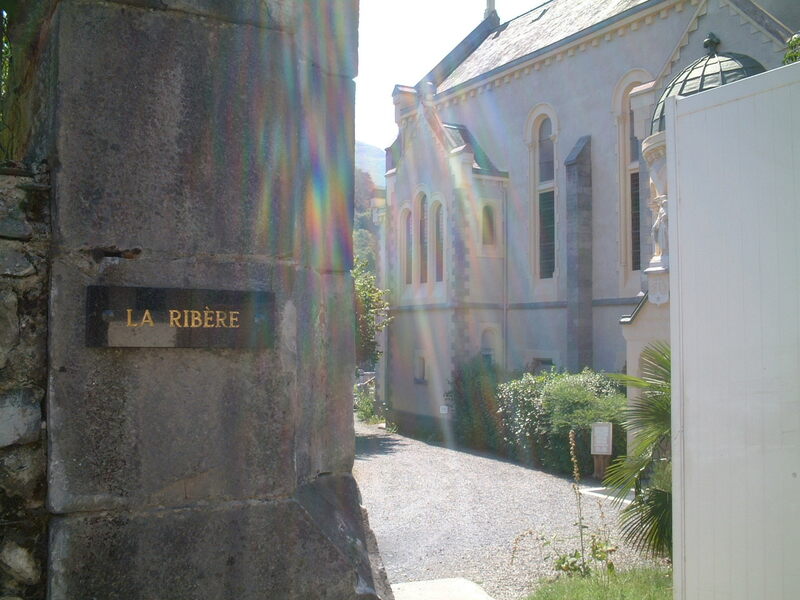 Since that day in 1858, the site of 'La Ribère' has been of particular significance, linking the 'Message of Lourdes' and the spirituality of Carmel. The site where Bernadette prayed on her knees before Our Lady on 16th July is now in the garden of the Carmelite Monastery. The nuns consider it their vocation to continue Bernadette's prayer, and to pray for the millions of pilgrims who come to Lourdes today. The Grotto of Massabielle which the Carmel overlooks is reminiscent of the cave where the prophet Saint Elijah, spiritual Father of Carmelites, burned with zeal for the Lord. When considering her vocation to the religious life, Bernadette Soubirous had wanted to join the Carmelite Order, but was told that her poor health precluded this possibility. There was no Carmel in Lourdes at the time of the apparitions. The Carmelite Monastery in Lourdes was founded 18 years after the apparitions on 16th July 1876 by nuns from the Carmel of Tulle in central France. The Mother Foundress, coming to Lourdes to find a suitable site for the future monastery, was very attracted by the land facing the Grotto on the other side of the River Gave. However, the terrain was on a narrow band of rock where any construction would be very difficult. Despite its proximity to the Grotto, previous visitors to the site had decided against anything being built there. The Mother Foundress had the idea of transporting soil to even out the level of the slope. This idea was accepted by the building contractors, and so the Monastery was built in a very privileged location overlooking the Grotto. In the years following the foundation, the number of vocations grew considerably. The community swelled to such a size that in 1893 a number of sisters went to found a Carmel at Le Havre in northern France. 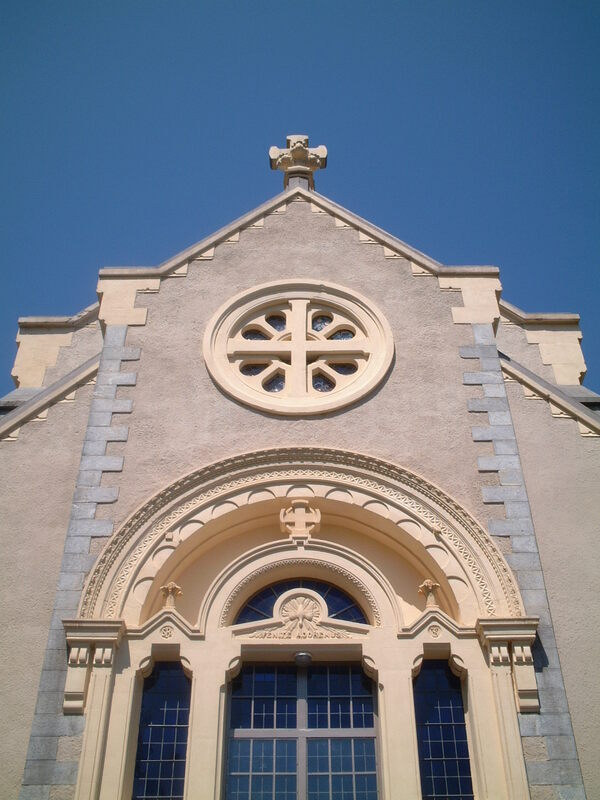 The Carmel is located off the 'Route de Pau' road, directly adjoining the Sanctuary or 'Domaine' of Our Lady of Lourdes. 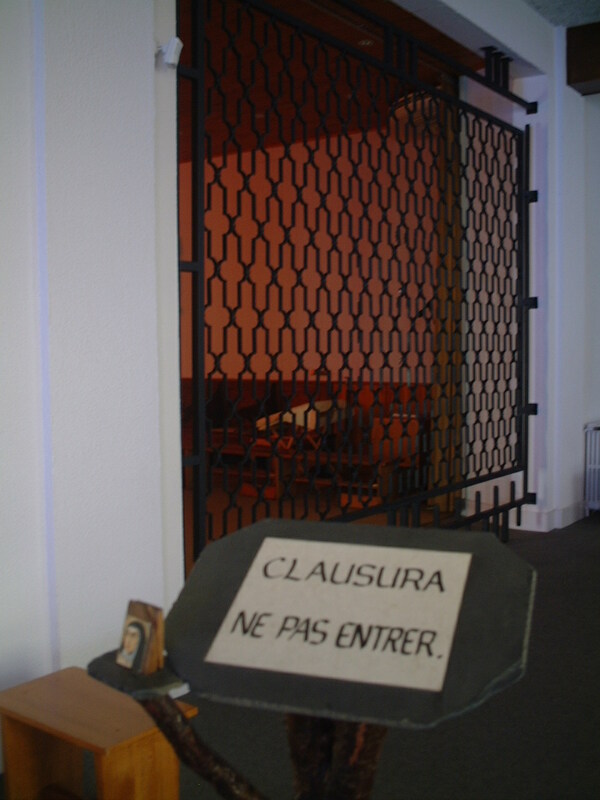 Despite signs directing pilgrims to the Carmel via a footpath, the Monastery cannot currently be accessed directly from within the Sanctuary itself, but only from the Route de Pau. Outside the pilgrimage season (3rd November until Easter), visitors can walk to the Route de Pau from Lourdes town centre. During the pilgrimage season, the easiest way to access the Carmel is by going through the Accueil Notre Dame, that is, the House of Welcome for sick and disabled pilgrims located within the Sanctuary. Visitors are welcome to take the various lifts from the ground floor up to the fifth floor of the Accueil, and exit the building by the glass doors in the centre which lead out to a coach loading area. Go out of the Accueil through the pedestrian gate on to the Route de Pau. Turn left, and the Carmel is a few metres down on the left-hand side. To return to the Sanctuary via the Accueil, simply press the buzzer by the pedestrian gate and wait to be buzzed through by the security guards. Please note, the monastery chapel and shop are both reached by a number of steps, and access is not possible for those unable to climb these steps. The Chapel is open for prayer throughout the day from the times displayed below. The shop is open 9.30am - 12 noon, and 2.15pm to 5pm. Please note that the Monastery does not offer accommodation to pilgrims, and is not open for visits of a tourist nature. The community only offers accommodation to young women discerning a religious vocation. 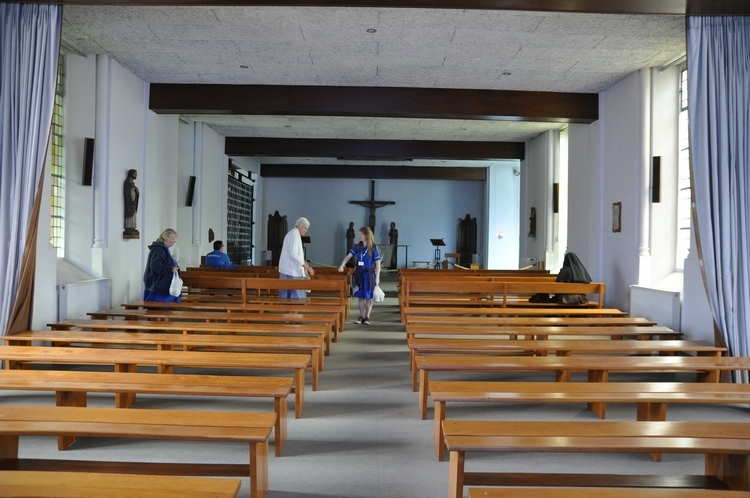 Visitors are very welcome to spend time in silent prayer in the Monastery chapel. Some pilgrims to Lourdes find the quiet atmosphere of the Carmel a specially tranquil spot compared to the often busy Sanctuary. The entrance to the Monastery chapel. The simple and beautiful interior of the Monastery chapel. 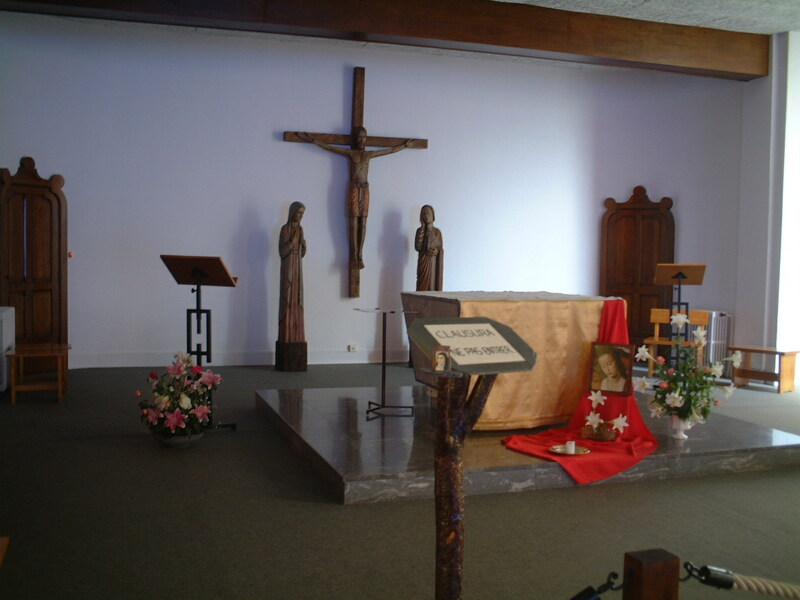 The main altar, and the grill of the nuns' enclosure. The Monastery shop sells a number of items made by the nuns, including: chocolates (many would say the best in Lourdes! ); biscuits; marzipans; linens and quilted fabrics; prayer cards; scapulars; images of Carmelite saints. Every sale helps supports the Carmelite community. To enter the shop, ring the bell of the door near the entrance to the Carmel, and wait to be admitted by one of the nuns. British Carmelite Pilgrims visiting Lourdes Carmel in 2015.
of layered stained glass typically found in Lourdes.